LinkedIn has always presented itself as a professional networking platform; a hub for influencers, recruiters, and jobseekers alike. Now they’re taking their commitment to helping their users fin d employment to the next level with the launch of their brand new ‘How You Match’ feature. As announced via the LinkedIn blog earlier this week, when you view a job on LinkedIn you can now look toward the right-hand side of the page to find ‘How You Match’. Here you’ll find a checklist of how factors such as your education level, skills, years of experience, and current job title, match up with the company’s stated requirements. As an added bonus for premium members, these users will also see their applicant rank within the posting, which tells said users if they’re in the top percentile of applicants for the job. 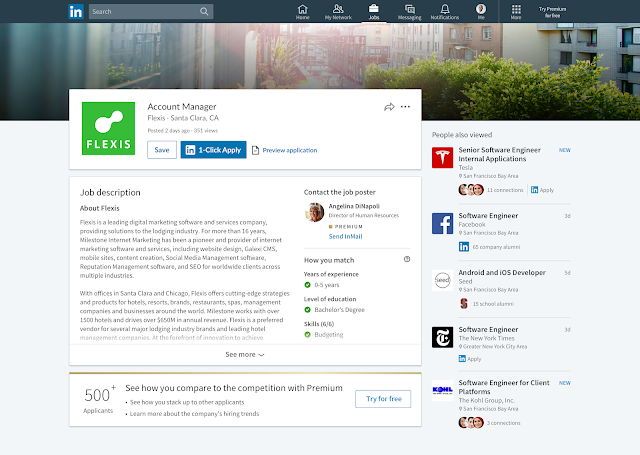 Along with the ‘How You Match’ feature, LinkedIn have also announced another new addition in the form of a 1-Click Apply button for certain job postings on both mobile and desktop versions of the platform. This, as the name suggests, allows users to save their basic information and resume so they can easily apply for a job with a single click or tap. Update your location, industry and current role. These will all not only help get the most accurate results from How You Match, but will also help recruiters find you and help us recommend the right jobs for you. Having your location on your profile also makes you up to 23 times more likely to be found in search results.